A foodie’s dream, the Taiwanese night market offers hundreds of different food and drinks to sample. The biggest and busiest night market is the Shilin Night Market, a top tourist destination in Taipei. If you prefer somewhere a little less crowded, Raohe Night Market or Tong Hua Street Night Market serves up equally delicious Taiwanese food too. If you can’t read Chinese, deciphering what a vendor is selling might be tricky, but here are the mouthwatering delicacies you don’t want to miss! 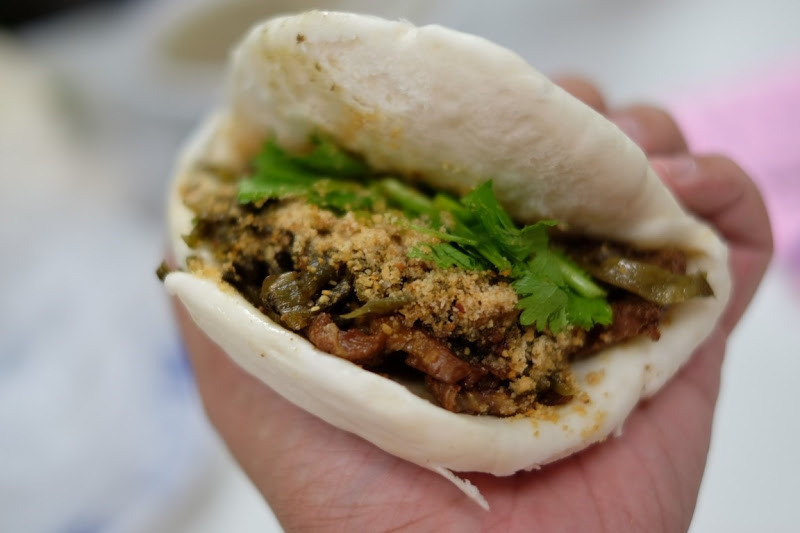 Perhaps you’ve tried a similar dish before at ramen restaurants, but this Taiwanese counterpart is the original steamed bao. This bun features a traditional filling of red-cooked pork belly, complete with ground peanuts, coriander, and stir-fried pickled mustard greens. The soft and fluffy bun, paired with the juicy pork belly is a drool-inducing combination that will leave you craving for more. Fried chicken has always been a staple of Taiwan street food. 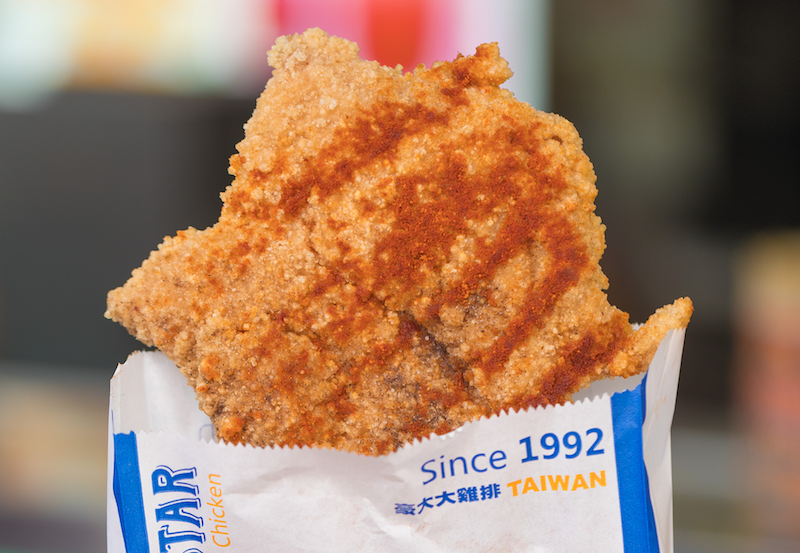 An incredibly popular fried chicken brand that you might recognise is Hot Star. Hot Star Fried Chicken also has branches all over the world. But what’s so special about this fried chicken? The chicken is pounded into a large steak, often larger than your face! It’s then deep-fried and seasoned with an addictive mix of spices – absolutely sinful and delicious. You might hate it, or you might love it. 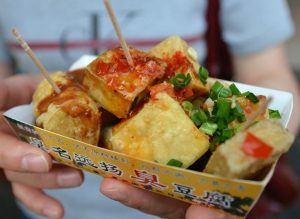 Don’t be deterred by the smell, as it may smell bad but it tastes scrumptious – or that’s what lovers of stinky tofu claim anyway. This fermented tofu dish is also served with pickled cabbage, carrots and a side of chilli sauce. One thing’s for sure though, you can’t escape the pungent aroma of stinky tofu when you’re at a Taiwan food night market. 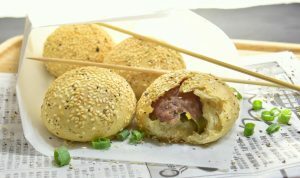 Another popular bun dish, Taiwanese pepper bun has a flaky biscuit-like outer shell containing succulent minced pork. The meat is marinated with white or black pepper and used to wrap green scallions. Bite into the crispy bun for a heavenly burst of flavour like no other. They’re usually served hot and fresh from a barrel oven, so be sure to eat them fast for the full gastronomic experience. Cool off with the refreshing lemon Aiyu jelly, a drink made from fig seeds. As the seeds are washed, a slimy gel is extracted from them. The gel is left to cool and it then forms into a gelatinous jelly. 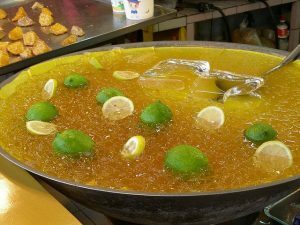 Served with sugar water and lemons, it tastes similar to honey lemon. This cold beverage is a welcome sight on warm and humid days in Taiwan. The name may sound strange, but this Taiwanese food dish is exactly what the name describes it to be. 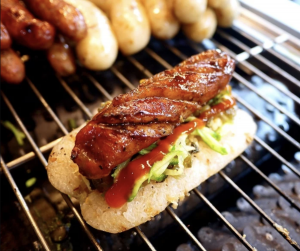 A large glutinous rice sausage is slit open and a smaller chargrilled pork sausage sits on top of it. The larger sausage essentially acts as a hotdog bun. In addition, this double sausage dish is topped with garlic, soy sauce, pickled bokchoi to give this dish some extra flavour.